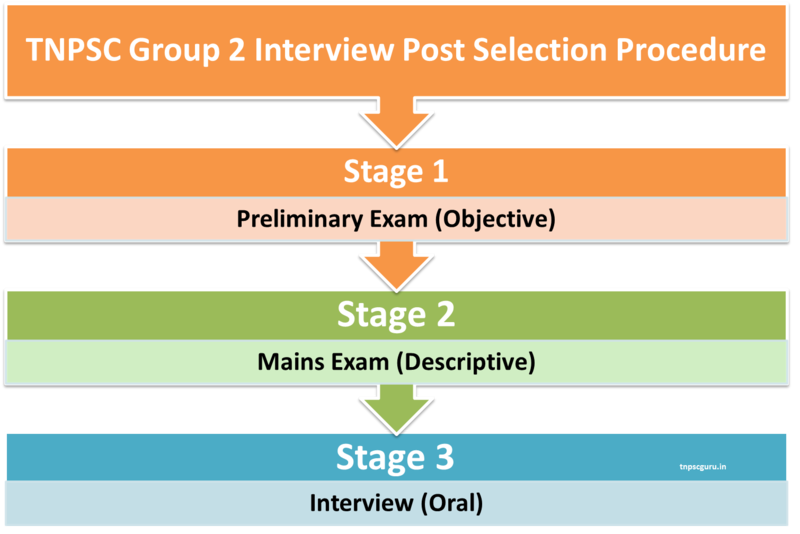 This article tries to explain you the whole selection procedure in TNPSC Group 2 Interview Posts. This post will be helpful for the new comers and also helps to know the changes made in the TNPSC Group 2 Interview Posts 2015 mains examination. The TNPSC Group 2 Interview Post Preliminary exam is fully of Objective Type. The Question paper will have 200 Questions in Total. Each Question carries 1.5 marks. So, 300 marks (200 Questions x 1.5 Marks) in Total. Based on the marks scored in preliminary exam, candidates will be called for the mains written exam in the 1:10 Ratio. And also the candidates with same cut off in all the categories will be allowed to appear for the mains exam. For Example, this time for 1241 posts, approximately 12410 - 12600 candidates may get qualified for the next stage. One more important point is the that marks obtained in the TNPSC Group 2 Interview posts Preliminary Exam will not be counted for the final selection of candidates. For final selection only the TNPSC Group 2 Interview posts Mains Exam Marks and the Interview marks will be counted. The mains exam pattern has been changed from partial objective and descriptive type to Complete Descriptive (essay type). Last time many candidates faced some difficulties in the TNPSC Group 2 Mains online exam objective type exam. This time the online exam has been scrapped for TNPSC Group 2 Interview Post Exam. So, only offline descriptive type exam for Group 2 mains. The maximum marks for Mains Written Exam is 300. Once again i thanking for your valuabe guiding. Is the physical and eye visible certificate to be submit while online application or later. Main exam can we write in tamil. pls give the study plan sir. WHICH STUDY MATERIAL IS BEST FOR GROUP 2 MAIN PREPARATION?